There are definitely some standard materials that we're all used to seeing in the kitchen: subway tile, marble countertops, and metallic hardware. But there's another design accent that's being used more and more in culinary spaces — wallpaper. It's a great way to bring a pop of personality and pattern into an otherwise utilitarian space. And if you're worried about pesky stains appearing on your pristine wallpaper, fear not, you can sop up water splotches with something called wallpaper dough (sold at hardware stores) or go with a vinyl option for easy wiping and cleaning. Wallpaper doesn't have to be relegated to just the walls. Some clever homeowners are even using it as a way to punch up their kitchen island, or as an inexpensive and colorful substitute for backsplash tile. 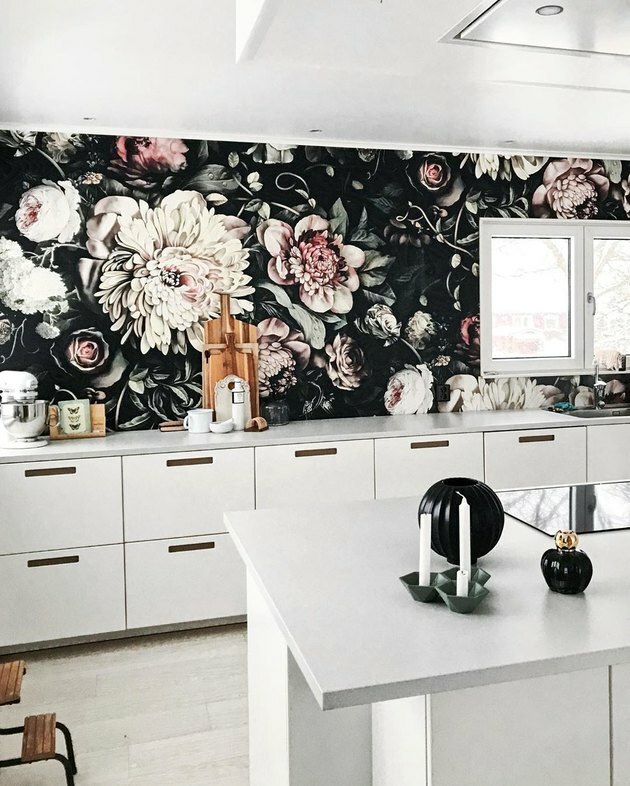 So if you've been craving something pretty to look at while you meal prep for the week, here are seven kitchen wallpaper ideas to get you started. 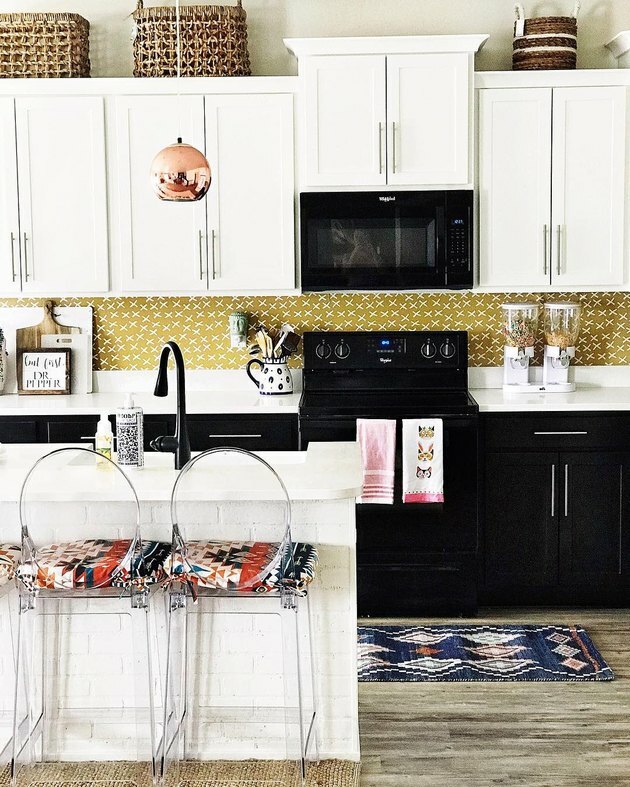 Marissa of One CrafDIY Girl certainly did get crafty when she came up with an ingenious kitchen wallpaper idea for her rental. She used a removable option on the walls and the bottom of her island, each in a different pattern that provides eye-catching contrast. The result is a beautifully patterned kitchen with wallpaper that can be swapped out anytime and won't hurt your security deposit. You know what's unexpected in a farmhouse kitchen? Palm leaf wallpaper, and it completely works. In this kitchen belonging to Carole of Dear Designer's Blog, a tropical print punctuates the white subway tile, rustic dining table, and farmhouse touches throughout. 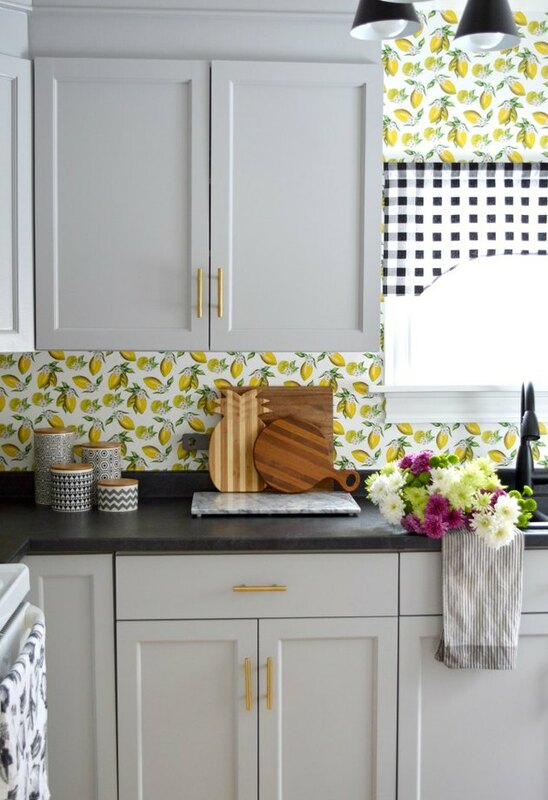 Jolie of Vintage Meets Glam loves throwback styling, which is evident from her sunny kitchen wallpaper idea that features a refreshing lemon print. Not only is it fitting for a cook space, but yellow is also a lovely way to add a bit of cheerfulness to your space. If you prefer a bohemian look for your kitchen, wallpaper is a wonderful way to create a laid-back, free-spirited vibe with the help of patterns. In this space belonging to Emily from My Boho Farm, goldenrod removable wallpaper showcasing a tiny white "X" print makes for a spot-on and attention-grabbing backsplash alternative. 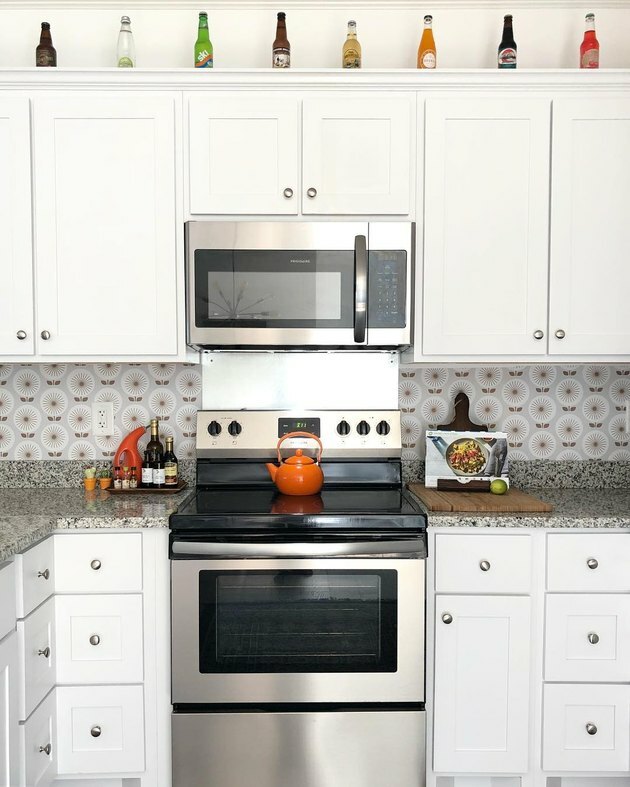 A retro kitchen wallpaper idea is ideal for a space that's overflowing with flea market finds or collectible dinnerware, and wallpaper can help those visuals look authentic. In a kitchen that has a definite 1960s vibe, Lela of Organized-ish has paired her orange accents and punchy soda bottles with a lively, throwback floral print. 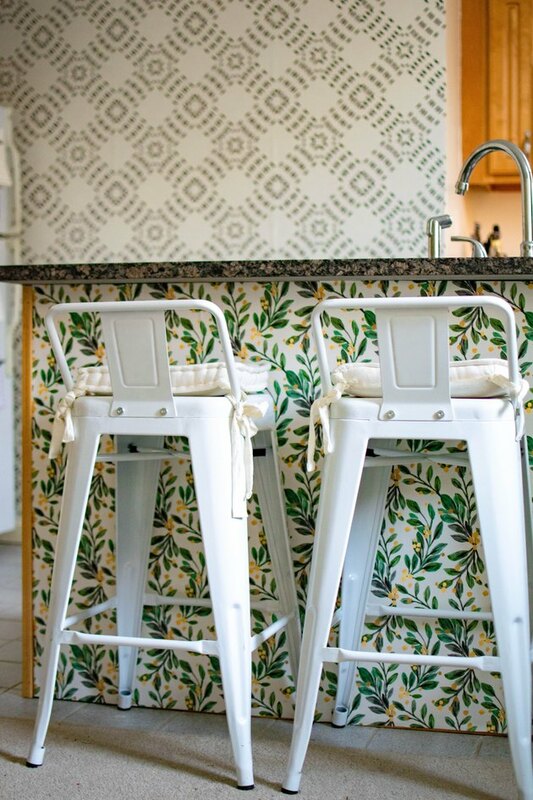 Don't be afraid to go bold with your kitchen wallpaper idea. If you're working with a large wall space, consider hanging a stunning, large-scale floral print. This striking option, designed by Ellie Cashman, instantly grabs your attention and pairs gorgeously with white cabinetry. 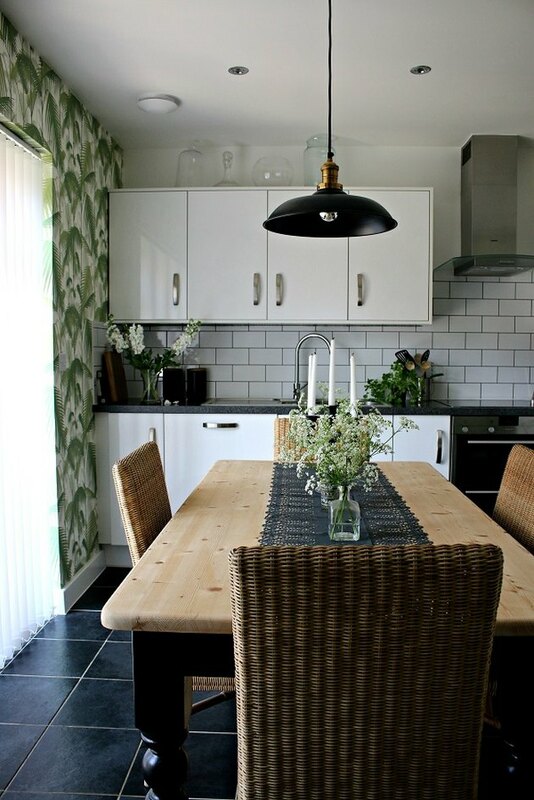 In addition to joyful meals shared with friends and midnight snack sessions, you can really create a happy vibe in your kitchen with fanciful wallpaper. 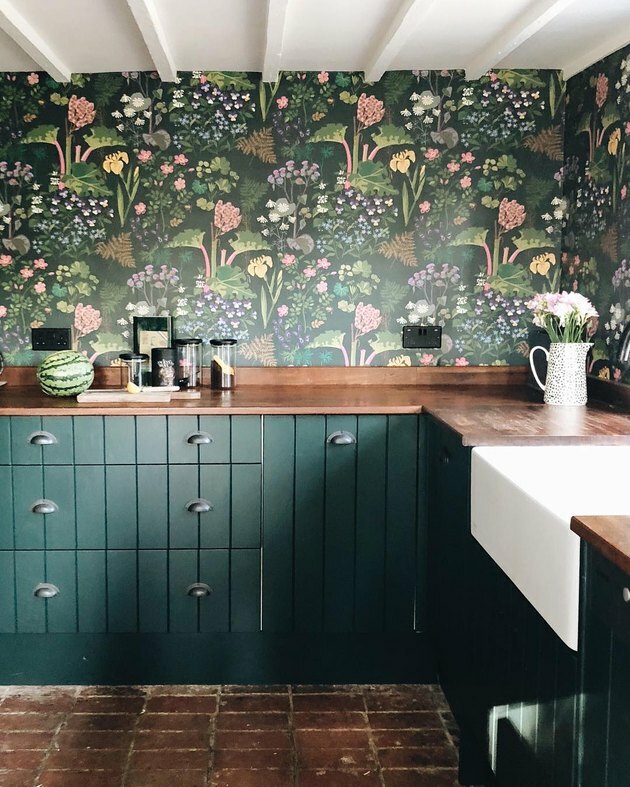 In this cook space designed by Kate Watson-Smyth of Mad About the House, the forest-green cabinets partner nicely with the lush foliage depicted in the wallpaper.